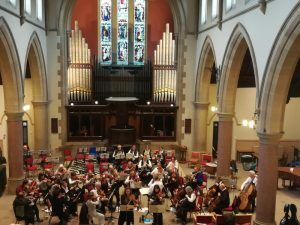 This is the orchestra rehearsing Mozart’s ‘Sinfonia Concertante’ in the United Reform Church in Jesmond, Newcastle, conducted by Andy Jackson and led by Sasha Raikhlina from The Royal Northern Sinfonia. 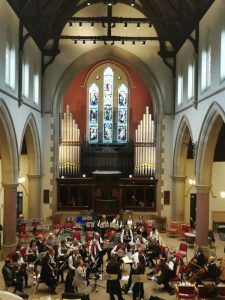 Our wonderful soloists were Jane Nossek (violin) and Chrissie Slater (viola). 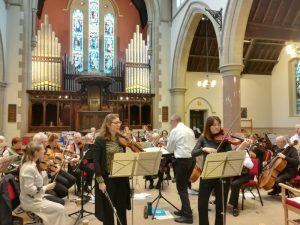 The programme also included Andy’s fabulous arrangements of Schulhoff’s Czech Dance, Tango and Tarantella, taken from his ‘Five pieces for string quartet’. This was a charity event with all proceeds for the Brundibar Festival.